I like to help people! I don’t do it for rewards or money or self-indulgent praise; I do it because you never know if the person you’re helping will suddenly decide to show her gratitude by ripping her clothes off and throwing herself at you. 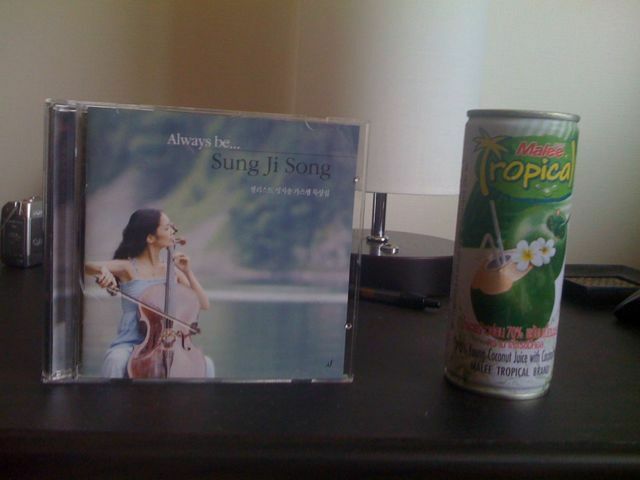 So far my random acts of kindness haven’t ended with any bow-chicka-wow, but dragging a huge duffle bag to a cellist’s door in my apartment building unexpectedly got me a CD full of cello music and, after taking a small mattress to the building lobby for another lady, she showed up at my door to present me with a weird looking can of what appears to be Thai coconut juice. Um… thanks! I think. And on an entirely unrelated note, I put a deposit on a very large purchase today! Photos and/or video to follow.